The DB2 instance is created in the instance owner home directory. This user ID controls all DB2 processes and owns all filesystems and devices used by the databases contained within the instance. The default user isdb2inst1and the default group isdb2iadm1. 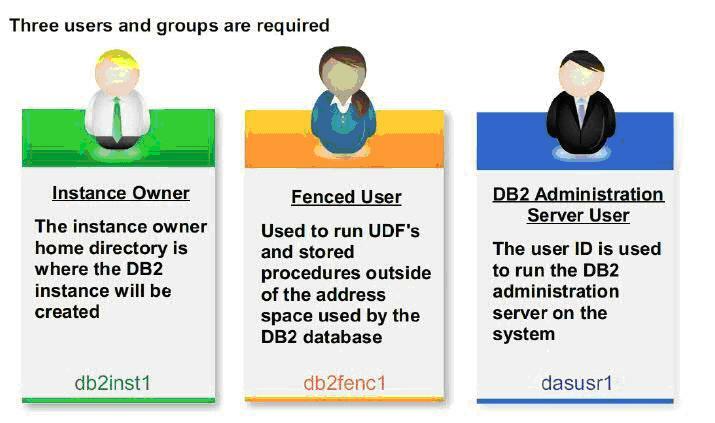 The fenced user is used to run user defined functions (UDFs) and stored procedures outside of the address space used by the DB2 database. The default user isdb2fenc1and the default group isdb2fadm1. The user ID for the DB2 administration server user is used to run the DB2 administration server (DAS) on your system. The default user isdasusr1and the default group isdasadm1. This user ID is also used by the DB2 GUI tools to perform administration tasks against the local server database instances and databases. There is only one DAS per computer. One DAS services one or more database instances, including database instances that belong to different installations. The DAS release level must be as high (or higher) than the release level of any of the database instances it services. The user IDs you create will be required to complete subsequent setup tasks. Log in as a user with root user authority.